I've been invited to be part of a two-day workshop with a extremely stimulating group of researchers, writers and practitioners on Machine Vision, organised by Machine Vision ERC, a project lead by Jill Walker Rettberg from the University of Bergen. Machine Vision in Everyday Life: Playful Interactions with Visual Technologies in Digital Art, Games, Narratives and Social Media is a five year, ERC-funded project that explores how new algorithmic images are affecting us as a society and as individuals. From the blog of the research project: "During the first workshop, the participants were invited to brainstorm on the future of machine vision and wrote fictionals blurbs of and bibliographies for the books that will need to have been written for us to understand this technological shift. The next step, we decided, is a book project - with twenty authors." Mawat forma parte del proyecto expositivo del programa VISIONA 2018 dedicado a territorio y despoblación, comisariado por Pedro Vicente. "La despoblación, la desertización, las migraciones y concentraciones urbanas vienen determinadas con frecuencia por el efecto devastador de la dimensión depredadora del capital. Estos modelos económicos actuales han desertizado no solo el mundo rural, sino también algunas de las concentraciones y expansiones urbanas que fueron consecuencia de la misma. Muchos de los artistas presentes en la exposición miran a esta despoblación desde los conceptos Terrain Vague (terreno baldío) y Tercer Paisaje, espacios obsoletos e improductivos, lugares vaciados de actividad en los que predomina la memoria del pasado sobre el presente. Son lugares obsoletos, desprovistos de función, son una especie de "espacios indeterminados" que ya no están definidos o que perdieron su esencia de uso hace tiempo, pasando a ser tierra de nadie y convirtiéndose en, como denomina Gilles Clément, espacios indecisos. Pero lo invisible no implica inexistencia. Esta exposición mirará a algunos de aquellos espacios y lugares que han pasado al olvido por el abandono, espacios presentes pero obviados tanto en el transcurso del crecimiento de las ciudades como los afectados por el natural deterioro que el tiempo les ha provocado, o aquellos afectados por la despoblación rural, que pueden considerarse dentro de las categorías contemporáneas del Tercer Paisaje y los Terrain Vague y que plantean el desafío de nuevas formas de interpretar nuestro entorno. En La memoria del territorio se podrán ver obras de los artistas Jorge Yeregui, Ibon Aramberri, Paco Gómez, Alejandro S. Garrido, Abelardo Gil-Fournier, Anne Laure Boyer, Martí Llorens, Marta Javierre y Fernando Gatón o el Colectivo NoPhoto entre otros. Además, la exposición incluirá una selección de fondos fotográficos de la Fototeca Provincial sobre pueblos de colonización, realizada por José María Alagón, y las presentaciones de los archivos fotográficos de José Luis Acín sobre pueblos abandonados de la provincia y del Archivo Oral del Pirineo de Enrique Satué." La imagen de este post es parte del proyecto curatorial que incluye una investigación en material de archivo, muestra la calle Mayor de Vencillón, poblado de colonización (Fototeca de la Diputación Provincial de Huesca). During the Spanish Inner Colonisation – a large-scale agricultural reform and land settlement program of the central decades of the 20th century – new towns were built in the middle of the arid areas that were going to be transformed into irrigated lands. Their names and locations were announced in the Official State Gazette together with their proposed locations. The system employed to address their positions in the wastelands was based on the road network: it involved the distances to the nearest roads, and the specification of the kilometric milestones concerned. This paper proposes to analyse the positioning system in relation to one of the most salient features of this Spanish program: the use of the so-called cart-module to distribute the settlement towns. These were arranged in constellations so that each piece of land could be addressed through a walking distance from the closest town. Taking into account also the role of the authoritarian State, present in the technical management of the irrigation systems, the agriculture put into work will be analysed as a vertical practice. This paper will consider these operations from what social anthropologist Penelope Harvey has pointed out as the topological quality of infrastructural spaces, where space is apprehended in relation to the effects of a calculating framework. The material transformation of this topological zoning through irrigation, finally, will be examined in relation to Lisa Parks’ critical infrastructure notion of satellite footprints and signal territories. Edited by Joshua Synenko, other contributors are: Jon Dovey and Duncan Speakman, Matthew Flintham, Jill Didur and Lychee Fn, Manuel Portela, Albert Acedo and Carlos Granelll-Canut, Jason Farman, Florian Sprenger, Wolfgang Ernst, Mona Abaza, Shana MacDonald, Lu Pan, Danielle Drozdzewski, Kurt Kraler, Markus Reisenleitner, Jessica Becking, Rob Shields, Jamie Allen and Joshua Synenko. "On the surface, the digital is about information exchanges and technological advances, but what lies beneath the shiny interface of digital culture? machines will watch us die explores digital decay as a process that encompasses different timescales and materialities. Information travels on components made of rare earth minerals and ores. By linking materials belonging to deep time – the million-year timescale of Earth’s ecological cycles – to the immediacy perceptible to humans, the artworks visualize different responses to digital decay." As part of an exhibition curated by Patrizia Costantin, the accompanying booklet contains my text "Solar Landscapes. Soil, Image and the Interventions of Vision". Recent space imaging developments have given rise to a spread of commercial services based on the temporal dimensions of satellite imagery. Marketed under umbrella terms such as environmental intelligence, real-time Earth observation or orbital insight, these imaging projects deliver the surface of the planet as an image flow encoded into video streams, where change and variation become a commodified resource on the one hand, as well as a visual spectacle on the other. Postprocessed by computer vision and machine learning algorithms, these services extend the geospatial logic of GIS systems to the surface of the image. Paths become trackable, objects classificable and movements predictable. Seen from the satellite networks, the surfaces of the planet are imaged as visual feeders for data-extractive algorithms. As aerial images become data, then, the Earth is operationalised as a legible screen, where the predicted predates the perceived. This workshop proposes to examine the use of video prediction techniques based on machine learning within this imaging context of the transformations of landscape. It seeks to explore the cinematic character of some of the active landforms of the planet, such as river thalwegs, drifting glaciers or crawling dunes. This way, the workshop will present the capacity to generate video-predicted landscapes as a platform to speculate with this particular entanglement between visual media and the surfaces of the planet, beyond the extractive and finantial contexts that have given rise to it. The workshop is part of an ongoing research on the image character and temporality of the planetary surfaces developed together with Jussi Parikka and the Archaeologies of Media and Technology group. Aerial views of the ground for mapping, control, or military exploitation have numerous forms of surface value: representational power, logistics, targeting, real-time surveillance, and mastery of space. This workshop elaborates on the double aspect of the screen as geographical and mediatic, as a material and epistemological part of value creation. It includes a seminar discussion with set readings as well as a practice-led component on “landscape prediction.” Participants will experiment with relevant machine learning techniques and speculate upon the entanglement of visual media with the surfaces of the planet. They will explore how predictive images of the Earth can affect ground-level operations and how the surfaces of the planet can extend this visual archive. “REGIÓN (Los relatos). Cambio del paisaje y políticas del agua” es una exposición fruto de la investigación sobre la transformación del territorio producida por la realización de grandes obras hidráulicas, con especial atención a los embalses del noreste de la provincia de León (Embalse del Porma y Embalse de Riaño) de cuya construcción se cumplen 50 y 30 años respectivamente en 2017. El proyecto toma su título y tiene como arranque conceptual la obra literaria Volverás a región (1967) de Juan Benet (Madrid, 1927-1993), ingeniero que construye la presa del río Porma en el leonés valle de Vegamián, y que mitifica en su novela el espacio natural y humano que va a anegar bajo las aguas, encarnando así el dilema esencial de estos procesos; aquel que vuelve antagonistas pasado y futuro, progreso y memoria. La exposición, distribuida en las sedes de la Fundación Cerezales Antonino y Cinia (FCAYC) y MUSAC, Museo de Arte Contemporáneo de Castilla y León recoge materiales de diversa naturaleza. Desde obras pictóricas a restos arqueológicos, material de archivos personales, prensa de la época, planos de ingeniería, expedientes de expropiación inéditos, documentales emitidos en televisión, libros centenarios de educación agrícola, películas, carteles o fotografías, además del trabajo de varios destacados artistas actuales que han reflexionado sobre el tema. Tiene como objetivo reunir en el presente todos los tipos de relatos, con sus luces y sus sombras, en torno a esta transformación: el relato institucional, el político, el periodístico, pero también otros como el de la memoria popular, el literario, el cinematográfico o el artístico." Encuentro experimental y taller práctico dirigidos a explorar los límites de la fabricación digital y el diseño en abierto. Coincidiendo con la Bienal Internacional de Arquitectura de Euskadi - Mugak/Fronteras, Hirikilabs plantea un programa de actividades que tienen como objetivo la exploración de los límites interdisciplinares (arquitectura, diseño, diseño industrial, prácticas maker & DIY/DIWO) y las fronteras entre las herramientas propias de los espacios de fabricación digital y las formas de compartir el conocimiento. El taller planteará una aproximación a la experimentación con herramientas de fabricación digital aplicadas a temáticas próximas a la arquitectura, contando para ello inicialmente con un planteamiento especulativo para pasar después al uso de las herramientas de fabricación digital en un caso práctico. En el proceso se tratará, además, de responder a los principios de la filosofía del diseño abierto planteando si sería posible generar propuestas documentadas para poder ser llevadas a un entorno real. Las sesiones permitirán la posibilidad de trabajar ideas como los printed landscapes, abordando por ejemplo procesos de terraforming, transformaciones del planeta y movimientos de tierra a gran escala como sucede en los pantanos, las plantaciones, las montañas borradas o las nuevas (creadas como contenedores disimulados de residuos), pudiendo trabajar sobre las divisiones creadas sobre la idea de los paisajes diseñados a gran escala, los que se proyectan en la pantalla de un ordenador y se implementan en territorios de gran extensión. "First by identifying the humanoid figure as an empty vessel; second by understanding that they can, and probably should, fill that empty vessel with their own self; third by embodying the figure and actively becoming part of the artwork; and fourth by exploring the surrounding universe as a participant of the artwork itself." Dentro del programa Otoño-Invierno 2017-18 del GE, atendemos a los procesos de modernización del campo español desde la posguerra hasta nuestros días y los efectos de la organización del territorio desde la tecnocracia. En esta primera jornada discurrimos alrededor del proyecto de Colonización Interior, proyecto de repoblación y reforma agraria franquista asociado al enorme desarrollo de la infraestructura hidráulica en esos años. Nos acercamos desde una mirada múltiple al proceso desde la sociología histórica y el periodismo de datos, así como a las mutaciones en el territorio desde una perspectiva estética. 18.10 h. Cristóbal Gómez Benito: Introducción general al proceso de Colonización en España. 18.40 h. Abelardo Gil Fournier: Mirada contemporánea al territorio a partir del proceso de colonización. Los espacios que habitamos actúan como una cristalización de procesos de distinta naturaleza y escala. El taller propone trabajarlos desde el sonido para explorar otras cualidades materiales y sociales del espacio. Abordaremos una aproximación site-specific en la biblioteca del MUSAC atendiendo a los procesos perceptibles e imperceptibles, tanto humanos como no-humanos que la configuran. Procesos cuyas escalas van desde las frecuencias de los dispositivos electrónicos en su interior hasta las órbitas de los satélites necesarios para su funcionamiento. Procesos que pueden pasar desapercibidos y que son, sin embargo, indispensables en su funcionamiento, como las tareas de mantenimiento y limpieza o la climatización del espacio. Todos estos procesos son infraestructurales, es decir, configuran estructuras que a su vez sustentan a otras. En este taller buscamos trabajarla temporalidad de estos procesos como presencias continuas, periódicas, rítmicas u oscilantes en el espacio, que lo construyen en su dimensión total. Trabajaremos el sonido como una herramienta para hacerpresente la temporalidad de estos procesos, para dejar que el espacio irrumpa desde su huella material. Emplearemos recursos cotidianos de grabación y reproducción, explorando además el uso divergente de apps para dispositivos móviles como alarmas y filtros de voz. You can download the full booklet here. The AMT manual of the Archaeologies of Media and Technology group has been published. I contribute with a short text piece on indistinguished screens and the alienation of vision. I've been invited to participate in a round-table with Jiann Hughes, Varvara Guljajeva & Mar Canet and moderated by Javier Burón. The discussion was part of the symposium Future Artist Makers in Medialab-Prado, part in turn of a larger project organized by The Nerve Centre en Derry, Ultralab en Madrid y Fab Lab Limerick. I proposed to the collaborative production workshop on data journalism to work on the digitisation and visualisation of the data related to the actions of the Spanish Institute of Colonisation. The project was selected and it became part of the Taller Periodismo de Datos "La España Vacía". During three weekends, spanned over a period of two months, a group of architecs, geographers and journalists collaborated to produce as a result a website, a data repository and several data visualisations in relation to the program of transformation of lands into large irrigation zones. The results of the project, elaborated together with Andrés Rodríguez Muñoz, Marco Rizzetto, Carmen M. Pellicer Balsalobre, Guillermo Cid and David Prieto, can be visited here: https://medialab-prado.github.io/poblados-colonizacion-colonias-penitenciarias/index.html. An image of an ongoing project on reservoir islands will be shown in the exhibition parallel to the conference Postcards from the Anthropocene: Unsettling the politics of representation, to be held in Edinburgh the days 22-24 June. From the website of the symposium: "This symposium proposes to explore this through the motif of 'Postcards from the Anthropocene'. The postcards that we imagine are documentary space-time snapshots, which convey complex assemblages of dynamic, non-linear, unpredictable, ad-hoc networks between interdependent and trans-scalar actants. They may raise questions about the ethical and political challenges of the dominant modes of technoscientific production in the Anthropocene, modes that are constituted through existing power relationships, subject positions, differences and inequalities. On the other hand, they might open up new streams of speculative and creative geopolitical imaginaries and forms of collective subjectivities that recalibrate existing value systems and indicate alternatives." During the week 23-28 of May I will participate in a seminar and research workshop at the Residual Media Depot of the Concordia University in Montreal (Canada). The seminar, on media archaeology, discusses material practices of labs and depots of media history, infrastructure as well as contemporary media theory, such as the cultural techniques-approach. Led by Darren Wershler, Lori Emerson and Jussi Parikka, I will participate together with other 15 international researchers and artists. Mediating Deep Space & Time is a three-part workshop series organised by the Screen and Audiovisual Research Unit (SARU), based at the Department of Media & Communications, at Goldsmiths UoL. The workshops will take place in April, May and June 2017 respectively and lead up to a larger conference planned for November 2017. Over these three half-day events, the aim is to facilitate extended discussion between academics and postgraduate/early career researchers. Presentations and workshop by members of Archaeologies of Media and Technology Research Group (Winchester School of Art / University of Southampton): Jussi Parikka, Mihaela Brebenel and Yi?it Soncul, Abelardo Gil-Fournier. About this issue of APRJA: "The latest edition of APRJA is about Machine Research – research on machines, research with mac"hines, and research as a machine. It thus explores machinic perspectives to suggest a situation where the humanities are put into a critical perspective by machine driven ecologies, ontologies and epistemologies of thinking and acting. It aims to engage research and artistic practice that takes into account the new materialist conditions implied by nonhuman techno-ecologies. These include new ontologies and intelligence such as machine learning, machine reading and listening (Geoff Cox, Sam Skinner & Nathan Jones, Brian House), systems-oriented perspectives to broadcast communication and conflict (John Hill, Dave Young), the ethics and aesthetics of autonomous systems (Maya Indira Ganesh, Maja Bak Herrie), and other post-anthropocentric reconsiderations of materiality and infrastructure (Abelardo Gil-Fournier, Etherbox interview). The journal issue has been organised in the context of ever elusive, the 2017 edition of transmediale festival of art and digital culture, Berlin, and follows a workshop co-organised with Constant association for art and media, Brussels." As part of a production workshop in Medialab-Prado, a project on the relation between soil and labour during the Inner Colonisation will be collaboratively elaborated between April and June. The use of prisoners of war as the forced labor that built a large portiong of the water infrastructures needed to irrigate large extensions of land, is considered in relation to the displaced settler population that farmed the irrigated lands -inside a very controlled and monitored production environment-. The rational and visually pleasant settler towns, celebrated by the propaganda of the dictatorship, is displayed parallel to the hidden and invisible concentration camps and penal colonies. Both constitute the visible and the invisible faces of the same logic - the extractive mindset that conveys the living and commodifies its worlding. Citlali Hernández y Nicolás Villa, Abelardo Gil Fournier, Arturo Moya Villén, Carlos Coronas y Pedro Veneroso. Tras la presentación, el mismo jueves 23, se celebrará una mesa redonda moderada por Gregorio Cámara, director de JustMAD8, que contará con la participación de Jaime G. Lavagne, presidente de EX, Paulina Bebecka, directora de la galería Postmasters de New York, y Gerardo Zavarce, investigador, productor y asesor en el campo cultural y de las artes visuales. A set of pieces belonging to The Marching Ants series will be on display in the exhibition "Cartographic Operations" that will take place in the Level 4 Gallery in Southampton, from Feb 20th to March 10th. A new exhibition on mapping opens on 20 February. ‘Cartographic Operations’ will sit alongside the exhibition in the Special Collections Gallery, ‘Beyond Cartography: Safeguarding Historic Maps and Plans’, and there will be a joint Private View on Tuesday 28 February, 5pm to 8pm. In Bernhard Siegert’s ‘The map is the territory’, he refers to the idea of ‘cartographic operations’. The suggestion is that our way of seeing the world is not simply represented in maps, but that map-making is itself a play of competing signs and discourses producing our subjecthood. These are the coordinates we come to live by, which in turn influence the marks and signs at our disposal when we seek to make and share representations of the world. The exhibition will feature works by Jane Birkin, Abelardo Gil-Fournier and Sunil Manghani & Ian Dawson. Clare Strand, Gary Hill, Rafael Lozano-Hemmer, Abelardo Gil-Fournier, Abraham Avnisan, Atif Akin and the TeYosh duo. Mineral Vision featuring in the group exhibition Unspoken Dialogues as part of the 2nd Post Screen Festival in Lisbon. The Post-Screen: International Festival of Art, New Media and Cybercultures (PSF2016) is a biennial festival that brings together a number of experts from various fields of research and artistic practice to promote interdisciplinary discussion and the presentation of creative productions on emerging issues related to the use of screens and their influence on contemporary thought. Unspoken Dialogues brings together a series of works that demonstrate the extraordinary impact that screens are having on contemporary thought, and speculates about the kind of communication that arises as a result of the confrontation between the viewer and technological devices. Faced with each screen, the viewer participates in a kind of dialogue that follows, in a subliminal and sometimes implied way, from the process of receiving, questioning and constructing meaning around that confrontation. During last 24-26 October I participated in this year's edition of the research workshop part of Transmediale, coordinated by the University of Aarhus, and hosted and organized this time by Constant Brussels. As stated in the website of the workshop, "[it] aims to engage research and artistic practice that takes into account the new materialist conditions implied by nonhuman techno-ecologies including new ontologies of learning and intelligence (such as algorithmic learning), socio-economic organisation (such as blockchain), population management and tracking (such as datafied borders), autonomous or semi-autonomous systems (such as bots or drones) and other post-anthropocentric reconsiderations of agency, materiality and autonomy." My contribution will address the case of the agrarian reform and land settlement program in Spain, the Inner Colonization, as a case of medianature that from the point of view of an art practice in relation to a technological present can be addressed in two ways: as a genealogy of a process of [soil] becoming screen, and as a critical inquiry [unmaking] into the very notion of making. The workshop ended up with a publication to be distributed in Transmediale 2017. Archaeologies of Media and Technology (AMT) is a research group that approaches technology and media writ large through their links to science, art, visual culture and critical theory with a strong emphasis on artistic practices. We investigate the conditions of existence of contemporary media technologies through design and art, in relation to both contemporary culture and cultural heritage with an eye toward the future. The group rethinks computing through surprising, innovative and fresh approaches. It is an office for speculative ideas, grounded research and investigations into the contemporary. "The conference explores the material and phenomenological consequences of both accelerations and decelerations, as well as the aesthetic strategies afforded or precluded by them. It is concerned with the material inscription, practical harnessing and social experience of varying speeds, from the perspective of contrasting temporalities. Particular emphasis is placed on transversal approaches reading across, and drawing into dialogue, seemingly incompossible positions within the fields of sonic and visual arts, cultural and critical theory, and media and communications." Tras una visita a la instalación en Matadero, el filósofo y amigo Fernando Broncano -autor, entre otros, de La melancolía del ciborg o Mundos artificiales- ha escrito en su blog, El laberinto de la identidad, unas reflexiones que pueden leerse aquí. After a visit to the exhition space in Matadero, philosopher and friend Fernando Broncano -author, among others, of La melancolía del ciborg or Mundos artificiales, has published in his blog, El laberinto de la identidad, a post about the project which can be accessed here. Como miembro de la comunidad investigadora de la Winchester School of Art (University of Southampton), donde estoy llevando a cabo un practice-based PhD, he colaborado con este post sobre el proyecto La colonización interior: puede leerse aquí. As a member of the research community at the Winchester School of Art (University of Southampton) -I'm completing a practice-based PhD there- I wrote a post about the Inner Colonization project. It can be accessed here. Seleccionado como artista en residencia dentro del programa El Ranchito de Matadero Madrid, estaré desarrollando el proyecto La colonización interior del 19 de octubre al 30 de noviembre. Los resultados de la residencia se mostrarán al público desde el 27 de noviembre al 31 de diciembre. Selected as an artist in residence at the program El Ranchito, in Matadero Madrid, I'll be developing the Inner Colonization project from Oct 19 to Nov 30. The results of this residency will be presented to the public from Nov 30 to Dec 31. Publication: e-flux supercommunity - Mineral Vision in "The Alchemic Digital, The Planetary Elemental"
Indeed, considering luxury culture, “Shine could be the paradoxically material base of an optical economy typically (mis)understood as being purely cognitive or immaterial.” The alchemy of such visual surfaces, as well as their material processes, seem to have fulfilled Zosimus’s fifth-century dream of “The Divine Art of Making Gold and Money” that rings true as to the place of technology in contemporary culture. Art projects also engage with this premise—for example, Abelardo Gil Fournier’s Mineral Vision installation (2015): a copper slab whose silent façade opens up through augmented reality vision, revealing the quasi-mythological world of hidden messages; the digital opens up the material that becomes itself readable. It’s the new, technological version of Roger Caillois’s The Writing of Stones. Deep and long interview to Jussi Parikka on the Geology of Media, speculative theory, the planetary dimensions of contemporary geopolitics... full of valuable references (with a mention to Mineral Vision) . "Images and sounds educate us and create the worlds in which we live; they can create ethical predispositions, not in the sense of moral guidelines, but to teach us to see in particular ways, with particular leanings. And they can also guide us to think of the thick materialities in which images and sounds anyway are carried: the work of modern media technological storage; transmission and processing which involve earth materialities so that we can see colour; we can hear fine-tuned sounds from vinyls to laser discs; we see through minerals." "... it is often in contemporary design and media arts that we find an audiovisual expression of this complex ecological situation. Contemporary art, from The Otolith Group to The Crystal World project (Martin Howse, Jonathan Kemp, and Ryan Jordan), to the work of Katie Paterson, to Critical Infrastructure by Jamie Allen and David Gauthier, provides examples of art that is embedded in thinking about the geological. More recent projects, such as Abelardo G. Fournier’s Mineral Vision, have addressed the connection of materials like copper and digital computation and vision systems. Indeed, we need to be aware that design and art projects are well-positioned to articulate this situation; it’s a mode of knowledge that works in and through art methods as methods of ecology; of working in and with the materials that constitute the technological culture even if often in precarious, sometimes even toxic, ways." El festival Media Art Futures incluye en su selección de proyecciones comisariada por Pau Waelder las documentaciones de Vividness y Facebots junto al documental Hello World! Processing. Media Art Futures festival featuring Vividness and Facebots documentation videos together with Hello World! Processing within the film selection curated by Pau Waelder. Proyección de Hello World! Processing dentro del ciclo sobre cultura libre y cultura digital que bit:LAV coordina junto a Culturatorium. Hello World! Processing featured in Docu:FORUM, a series on free culture and digital culture organized by bit:LAV together with Culturatorium. En abril participaré en el programa de arte paralelo al festival de teatro independiente Surge Madrid 2015. Intervendré el espacio de la vitrina de la mítica sala Cuarta Pared. During April I'll be participating in the art program paralell to the independent theater festival Surge Madrid 2015. I've been asked to intervene a space in the well known theater Sala Cuarta Pared. Mineral Vision is being shown in the OA Foundation stand in the ground floor of the JUSTMAD 2015 art fair. As part of the Franqueados 0.15 exhibition in window shops, Factory of Mineral Vision is being displayed in Optica Alohe, C/ San Andrés 2, from Feb 19th to Feb 28th. Art2Drone Catalog features "Crowd Colorations"
Art2Drone is a catalog of art projects that explore diverse and critical approaches to “drone” technologies. In recent years radio controlled and mobile application driven quadrocoptors have become ubiquitous toys simultaneous with greater public awareness of commercial and military uses of UAVs (unmanned autonomous vehicles). Artists have adapted these tools for their practices. You can download the catalog directly here (pdf file). Mineral Vision has been selected to be shown in the JUSTECH 15 exhibition in JUSTMAD, an emergent art fair, together with works of Marina Corach (Mexico), Jorge Luis Vaca Forero (Colombia), Anaisa Franco (Brasil) and the group formed by Citlati Herna?ndez (Me?xico), Nicola?s Villa (Colombia), Ona Sallas i Batle (Espan?a) & Andre?s Costa (Chile). Una aproximación habitual a las dinámicas de colaboración parte de una visión en la que individuos separados, aislados e incluso categorizados previamente (en disciplinas, por ejemplo) se encuentran y pasan a organizarse, a pensar y a trabajar en común. La colectividad aparece en este relato como un envoltorio desplegado a posteriori sobre esta matriz anterior de singularidades individuales y sostenido por herramientas y metodologías catalizadoras. ¿Cómo podemos atenuar las diferencias categóricas entre humanos, tecnologías y naturaleza, y poner en primer plano una visión de los afectos, movimientos y relaciones entre partes? En esta presentación, que tuvo lugar en el simposio internacional Interactivos?14. Repensar la acción y el comportamiento colectivos, mostré cómo el trabajo que he realizado en estos últimos años ha ido centrándose en los soportes imperceptibles de la colectividad: su materialidad molecular y algorítmica y su actividad creadora. I've been participating in the Interactivos? '14 workshop on collective behavious as artistic advisor during two stimulating weeks of collective production and discussions. Interactivos? '14 is an initiative born from the common interest of the Neuroethology Lab at Instituto Cajal (CSIC) and Medialab-Prado to explore new ways to understand, measure, analyze and tapper the benefits of human collectives in life, science and art. What can we learn from other species sush as ants or fishes about the way our brain works and our collective behaviour? - How social networks help us understand human collectives? - How do we interact with each other and with our environment? - What kind of collective actions allow our cities and hwo does internet affected them? - Is creation an individual or collective matter? - Is learning a solitary process or implies interaction with others? - Is there a natural tendence to cooperation? - To what extent are collectives capable of self-governance? Are leaders necessary? - What are the possibilities for art in collectives? - What new forms of political expression can we use in collectives? -What kinds of new technology will help us understand and enhance social action? Mesa redonda sobre 'Producción Artística' en "IV Encuentro sobre Redes Sociales en Museos y Centros de Arte y Producción from musacmuseo on Vimeo. Documentación de la mesa redonda en la que participé junto a Quimera Rosa y Oscar Martín. Mi presentación comienza en el minuto 37. The theory of new materialism is traversing many disciplines of knowledge: from quantum physics to art theory. This allows a search for a common ground for interdisciplinary studies. In addition, these theoretical approaches are proving themselves as a suitable “ethic-onto-epistemological” framework (Barad, 2007) that permits the examination of social phenomena from multidimensional perspectives, alongside offering new ways to theorize and challenge the divisions between matter and discourse, nature and culture, etc. However, the methodological parameters of these approaches remain underdeveloped and somewhat unclear especially when related to feminist theories and politics. New materialism has been coined as a “third wave feminist epistemology” (van der Tuin, 2009) in the present globalized information society, and it is because of this that a profound reassessment of some of the core research concepts is needed if these ways of theorizing want to configure themselves as an alternative to social constructivist approaches specifically in the context of digital cultures and political engagement. To these methodological concerns, we have included ‘gender’, ‘politics’ and ‘the digital’ because of their centrality in scholarly debates produced in feminist journals and scholarship. The terms also remain key for contemporary feminist practice. Can we still consider gender as a key concept for feminist politics? 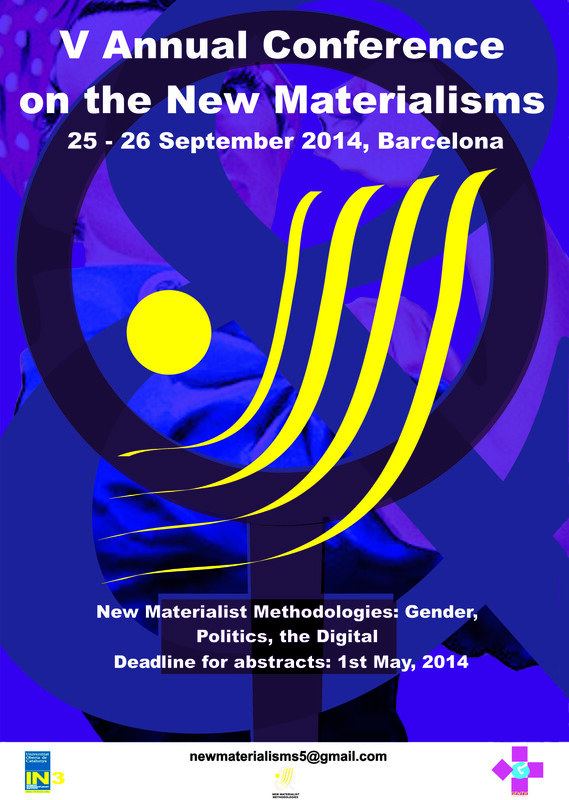 How is social change conceived of and produced within a new materialist framework? How is digital inter-connectedness affecting/affected by new materialisms, and most importantly different forms of life? Next weekend, September 20-21, I'll be participating in the IV Encounter on Social Networks in Museums, Art Centers and Production: Intermedia_Networks_Ecosystems. I will present my practice in a round table discussion together with Oscar Martín and Quimera Rosa. Following, the documentary co-directed with Raul Alaejos and produced by Ultra-lab, Hello World! Processing will be projected. Immigrant Sounds is a participatory exploration of the urban space proposed by María Andueza and Abelardo Gil-Fournier throughout concepts such as presence, permanence, displacement or settlement. During the performance the participants will freely move in a particular area of the city of Stockholm while carrying a small electronic device that will broadcast a cicada-like sound, characteristic of the sonic environment of southern countries. A set of ideas and questions will be provided to each participant in order to stimulate this specific exploration of the urban social environment. Immigrant Sounds is part of Re(s)on-Art, an International Artistic Research Conference with actions in Public Space held in Stockholm between September 9-12, 2014 at ArkDes, Skeppsholmen and throughout Stockholm. Re(s)on-Art is organized by Monica Sand and Ricardo Atienza, artists and researchers in ArkDes, the museum of Architecture and Design of Stockholm. Re(son)-Art – the art of resonating with/in/through the city – intends to explore everyday situations in public space and encourage daily urban awareness by collective actions. A number of interventions will be arranged in Stockholm by the conference participants, based on their research and artistic practice. Everyone is most welcome to participate actively in all events of Re(s)on-Art! Next June I'll be participating in the Cloud and Molecular Aesthetics conference organized by the Operational and Curatorial Research and the Pera Museum in Istambul. In the event, that will bring together inspiring authors such as Jussi Parikka, Anne Balsamo, Ljiljiana Fruk and Darren Tofts, I'll be presenting my last work in the context of the synthesis of colors and the materiality of images in a session with Genevieve Tremblay, Milena Szafir and Simone Mandl & Petra Gemeinboeck. In his first color film, Red Desert, Michelangelo Antonioni showed the effects of chemical pollution over an industrial landscape through the experience of the main character, a woman affected by a nervous syndrome that altered her senses. Visually, the film is characterized by the continual appearance of elements with striking colors that introduce in the image the synthetic and toxic substances present in the atmosphere of the industrial plant. Colors, visible on painted surfaces, clothes or gas emissions, appear as active agents that leave the surface of objects to invade the space and characterize the mental state, health and relationships of people within it. This paper presents my research on color as an agent that materializes the action of another industry, the IT one. From the point of view of the digitalization processes of objects and images, every color surface can be addressed as an information surface, susceptible of being recodified in real time through a large number of techniques, and its colors changed consequently. In my last works I have explored the use of projections and overprints of grids of benday dots to digitally modify the perceived colors on objects. This paper presents these projects -Vividness, Chromogeny and L’image est une machine malade- contextualized in relation to the theoretical work of Esther Leslie, historian of art, around the history of the production of synthetic colors. Film by lesfilmsduhiboo.com documenting the wonderful encounter in Nantes, where people, installations, workshops, films and generative graphics met in an inclusive and critical event full of inspiring ideas and exchanges. I have been interviewed byJulie Salmon for the french online tv magazine vlipp.fr in the context of a piece on the Processing [Art] event in Nantes at Stereolux where I was invited to participate. Increasingly complex interactions with machines blur the differences between matter, life and conscience. Next Thursday and Friday I'll be in Stereolux (Nantes) speaking about Hello World! Processing and working in a workshop on the alien generative energy stored in algorithmic systems, where we'll get to work with Vectorfields and Graphs as basic models of natural and artificial environments. Vanessa Alonso interviewed me for the WBAI -a classic among NY radio stations, the one where Max Neuhaus for example performed his Public Supply experimental piece- and we chatted about Vividness and the relation of art and technology. The interview begins approx. at min 5. Refest is a 3-day art and technology festival that celebrates the convergence of new and old, digital and analog, near and far. The artists featured in Refest are those who are breaking open possibilities through their practice. Creators working across a broad range of technologically informed media will gather at CultureHub in New York City to share video, performance, music, and more. Refest invites artists to share how they are reforming, rebuilding, reiterating, and renewing ideas. Fantastic experience meeting the team that rules Medialab USAL, discovering their projects and discussing Hello World! Processing with a group of art students from the Universidad de Salamanca. Last Tuesday, Nov 5th, I participated in a conversation with Daniel Miracle on his experimental and open source TV, Neokinok. The hangout was organized by Comandante Tom in the context of the DoingDoing conversations. Last week I published a simple GUI to common toxiclibs operations for algorithmic mesh manipulations. Based conceptually on the HemeshGUI by Ammon Owned, this interface was developped for a workshop in San Sebastián, and was meant to show how we can reelaborate 3d models through coding. I've been invited by the Art & Technology lab of Arteleku, coordinated by Daniel Artamendi, to workshop together with artist Dario Urzay in San Sebastian during two days, 20-21 October 2013. Telefonica Foundation asked Ultra-lab, a company which I'm partner of, to develop a visualizacion of the VIDA Prizes database. We proposed them to show the collection in a 3D environment that could be explored by the users in a first person game-like navigation. The space was designed to create the illusion of an unknown territory that is being occupied by experimental and rhizomatical practices. The metaphor of a space fill with colonies of exotique creatures drives the whole experience. You can see a set of images here. How can we think of systems, abstraction and emergent behaviours through digital fabrication? How can we grasp the notion of growth of structures, or of digital structures as well, with the aid of multiple 3d printers working at the same time? Daniel Artamendi proposed a very interesing workshop around these topics to Pello Mitxelena, a vasc sculptor, and me, as part of the workshop program he has been developing in Arteleku (Donosti). Rather than thinking of printing objects, how can we start to think of the idea of printing systems? The workshop was a two day creative meeting with several people with different backgrounds, from architecture, education and engineering to arts. In order to introduce some concepts around algorithms to the participants in the workshop, I prepared a series of tutorials in Processing connected to the building of elementary snappable "coded" pieces. This code has been further elaborated by Mikel del Valle and will be released soon as an open source tool to "program" printable pieces. Abelardo Gil-Fournier eta Pello Mitxelena. Elkarrizketa - entrevista. from ARTELEKU on Vimeo. The city is a process landscape where people, machines and infrastructures cohabit and populate a space-time experience so complex that allows infinite variations and local site specificities. This was a 5 day workshop where we set up a process of intense collective creation and discussion with a complex videogame as a result. - Day 3: A specific open space, the park - Mobile cameras, image upload, public sharing content networks.